RELEASE DATE November 15, 2016 !!!!! 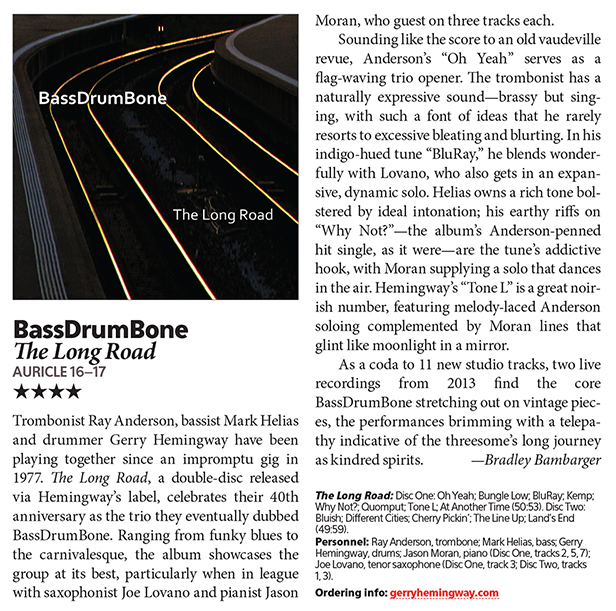 Downbeat Magazine & Bradley Bambarger offers its take on "The Long Road"
The two-CD set, The Long Road (Auricle Records AUR 16/17 gerryhemingway.com), offers 13 examples of BassDrumBone’s cooperative talent, mostly as a trio, but like a roast improved with seasoning, adding either tenor saxophonist Joe Lovano or pianist Jason Moran on some tracks. Lovano’s expositions, which function with explosive power on BluRay and Bluish, confirm the rhythmic sides of BDB as the saxophonist’s reed vaulting doubles the trombonist’s gutbucket whinnies. Vigorously backed by slap bass and drum rolls, the tunes demonstrate how to swing heartily without abandoning technical skills, and also suggest how Anderson’s rollicking brass ensemble operates. Moran’s targeted keyboard musings help showcase BDB’s other skills as the four dynamically invest Bungle Low and Tone L with subtle colouration, balancing among individual timbral elaboration, as they take turns shadowing each others’ advances. Solidly walking or subtly vibrating throughout, Different Cities confirms how Helias sounds on his own, with the bassist given space to thrust an opulent section of arco expressions on multiple strings into the mix, finally engaging in a dialogue with the trombonist’s vocalized cries. BDB’s ability to disguise itself as a carefree jump band is given full reign on the set’s two extended live tracks as well as At Another Time. Not only does the last allow Anderson to showcase every manner of smeared and slurred tailgate tones, but Hemingway moves upfront with a spectacular display of cymbal clanks and paradiddles, reminiscent of drum masters from pioneers like Baby Dodds to the most modern stylists. Jazz Trios consisting of a bassist, drummer and trombone are actually just as rare as forty years ago when BassDrumBone Connecticut was founded. Without a chordal instrument The trio made a series of equally elusive as fresh-sounding jazz records, while Mark Helias (bass), Gerry Hemingway (drums) and Ray Anderson (trombone) also also several collaborations contracted. For 2017, all calendars swept clean. 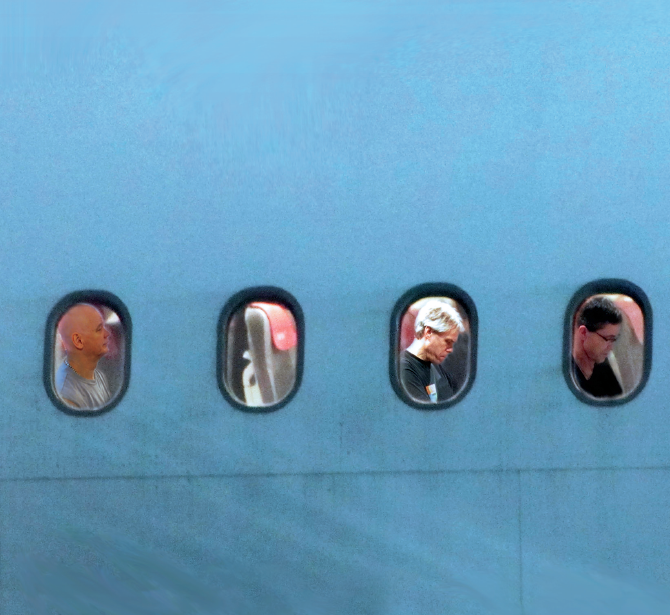 This year the trio celebrate its anniversary with a great tour, hopefully this summer also will visit the Netherlands. The Long Road, the double album which as an introduction to the end of last year appeared the festivities, in each case the most impressive business card. The three are like on previous records completely equivalent to each other. Improvising they do it most preferably at the same time. Each playful poke (plaagstootjes) handing out and just playing the notes you do not expect. A cheerful chaos, which the two guest musicians, saxophonist Joe Lovano and pianist Jason Moran, some appropriate liberal contributions to deliver. Clever how they have a place found in the music of this trio, forty years no intruders tolerated. 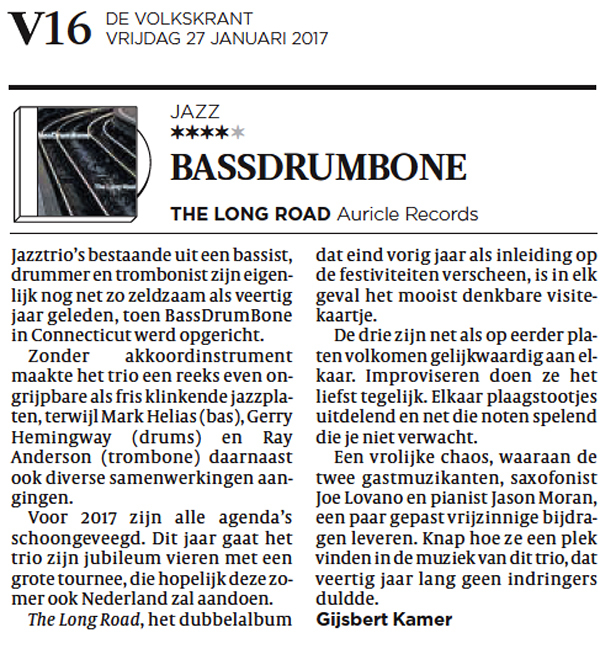 This wanna-be haiku encapsulates The Long Road, a double CD from BassDrumBone that celebrates the trio’s 40th anniversary. Original songs by bassist Mark Helias, drummer Gerry Hemingway, and trombonist Ray Anderson comprise this 13-song program recorded last year in Brooklyn. (Tracks 12 and 13 are “live” performances from Switzerland, recorded in 2013.) And for the first time in the trio’s 10-disc discography, the ensemble becomes a quartet when pianist Jason Moran and tenor saxophonist Joe Lovano collaborate-in on three tracks each. On “Kemp,” a rapid romp composed by Hemingway, Anderson’s alertness keeps him from getting tangled-up in the sonic jump rope. Space to fill/feel is tight here, but Anderson plays only what needs to be played when possible. Then, when Anderson’s portion ends, the exclaimed growl from his ‘bone really seems to be him toweling off after such a wild workout. BassDrumBone first becomes a quartet when Moran appears on Helias’ “Bungle Low.” Here, the interplay between Anderson and Moran begins naturally, as they state the melody together. Then they transform into search mode, in what really resembles two children exploring a toy box of sounds. As Helias guides them back onto the road marked “Melody,” they are now men who have matured naturally. Moran – who also performed separately at the Festival – is widely acclaimed for having imprinted his signature on Charles Lloyd’s quartet. This imprint, which welcomed a deliberate, take-all-the-space-you-need/want-to-let-the-ideas-blossom approach is evident on Hemingway’s “Tone L.” This meditative performance allows Moran to paint on a landscape Created by his colleagues. Moran’s low-toned ruminations, the plunger-muted trombone, the bowed bass, and the nuanced drums all push the atmosphere into its own direction. This performance culminates when everyone rises in intensity without becoming a cacophony that leaves anyone behind. Now Lovano joins the cats on Anderson’s “BluRay.” The weary blues are conjured here by the muted ‘bone and tenor saxophone. Helias’ soulful vamp is supported by Hemingway, who makes it all feel good as the horns share thoughts. On Lovano’s two other takes, “Bluish” and “Cherry Pickin’”, each composed by Helias and Hemingway respectively, the ensemble explores hard bop and the cool with equal conviction. Anderson and Lovano’s unison sparring gives the former a retro, Blue Note-type toughness, while the subdued, orderly mood on the latter shows an appreciation for those about to chill. Lovano’s presence is valuable, as he brings out the bop, especially from his frontline foil. “Cherry Pickin’s” placement serves as a great segue in contrast to “The Line Up” and “Lands’ End,” the “live” performances. If the studio performances display the trio at their clean-shaven, shirt-tucked-in best, these “live” performances show them after hours, where they let the shirt hang out, ditch the razor, and s t r e t c h…at long length. These performances – which total more than 30 minutes – reveal how musicians adept at improvising collectively, while naturally embracing the compositions’ melodic cores, will make all who experience them appreciate this four-decade dance. Allowing their instruments to serve in lieu of surnames as an embodiment of their amalgam, trombonist Ray Anderson, bassist Mark Helias and drummer Gerry Hemingway are together a case study in how to sustain a truly collective band. Their longevity now spans nearly four decades, an approaching milestone noted by Hemingway in his accompanying essay to The Long Road and a lifespan begun when each of them was just a few years in to their respective careers. All three have fielded a multitude of projects in the interim as leaders and sidemen, but this configuration remains a cornerstone of their creative endeavors in guaranteeing an experience of equals. Split over two discs the program is a compendium of recent activity, specifically a pair of studio dates from the summer of this year and Swiss concert by the trio from the spring of 2013. Tenorist Joe Lovano and pianist Jason Moran guest independently on three pieces apiece on the former material. Each visitor brings a strong personality to the proceedings, both pulling the core ensemble in a more palpable postbop direction without compromising the band’s freer leanings. Lovano’s lush and raspy tone on Hemingway’s “Klemp” contrasts with Anderson’s more guttural and glottal phrasings and the two sway and saunter against a fat and ambling beat broken by sudden suspensions and gliding syncopations. Anderson’s “Why Not?” capitalizes on Moran’s facility with locked hands chords. A particularly ripe and rotund ostinato from Helias shadowed by Hemingway’s brushed punctuations sets up an anchor around with the pianist and the composer circle and spar. Moran’s economy of note choice recalls the spartan proclivities Mal Waldron, combining simplicity and directness and repetition to shape an edifice suffused with immediacy. Lovano lines up his horn with Anderson on Helias’ “Bluish” to an astonishing tonal degree, the pair somersaulting through a stream of overlapping lines above another pulsing framework established by the composer and Hemingway. Both men use the mechanics of their instruments along with sterling embouchure control to approximate the sound of garrulous voices. As engaging and affirming as the augmented pieces are, those featuring the trio in isolation are easily on par. Hemingway’s “Different Cities” erects another descending line, parsed by pauses and angled detours his drums finding and concealing an elusive pocket in equal measure. “Quomput” affects a similar hat trick with the tonal center shifting subtlety between Helias’ robust, rapid pizzicato and Anderson’s sweetly puckered articulations. The two concert pieces highlight the band’s ability with long form improvisation, each working off flexible and fertile lines of Helias’ devising. Aspiring bands of any stripe would do well to look to BassDrumBone for an effectual tutorial on how to preserve a more perfect union. Tenth disk and forty candles to be blown out for a solid and irresistible trio like Mark Helias's BassDrumBone, Gerry Hemingway and Ray Anderson. It celebrates this occasion with a double disc that additionally invites guest pianist Jason Moran and saxophone player Joe Lovano; a completely logical choice given the adventurous nature of both musicians, even in a context of continuity with tradition. The music of the trio nourishes the basic elements of African-American language, rhythm, timbre, strong interplay: in this sense the synthesis, performed by musicians who over these four decades have shared research and stages with very daring explorers such as Anthony Braxton or Wadada Leo Smith, notes a happy dialogue between what is "inside" and what is "out," sound tension is always guaranteed by a solid geometric basis. There is a lot of blues in the beautiful compositions of The Long Road, as in the thrilling "Blueray" episode. The presence of Lovano gives the trio a more emphasized polyphonic quality, as well as that of Moran, with a beautiful dark and percussive tone that reconnects to a pre-bop lexicon. By Anderson, Helias and Hemingway, what can we say in 2017 that has not been said yet? Maybe nothing, but it's worth remembering how much the freshness of improvised practice (the last two tracks of the disc, live, give it some exciting moments) is a matter of aptitude even before age. Amazing all of these years, dear BassDrumBone! It’s an amazing notion that the cooperative trio of BassDrumBone—bassist Mark Helias, drummer Gerry Hemingway and trombonist Ray Anderson—has been making music for the last 40 years. The Long Road documents and celebrates this journey on Hemingway’s Auricle Records and, as a special treat, augments the trio with the tenor saxophone of Joe Lovano and the piano of Jason Moran on this two-disc set. Anderson’s “Oh Yeah” kicks off the celebration, with an ebullient New Orleans theme. The trombone master bursts out of the speakers with giddy whinnies and fat blats emanating from the bowels of his horn while Hemingway lays down an irresistible snare drum groove. “Bungle Low” adds the luxuriant harmonies and rhythmic shadings of Moran, who lets his fingers fly with a knotty, imaginative solo. Anderson and Moran create an attractive synthesis. “Blue Ray” represents a highlight moment, with its noirish theme adding Lovano for a series of gutbucket turnbacks. “Blueish”, from the pen of Helias, opens Disc 2 with Anderson’s gruff and blustery timbre teasing a slinky, then screaming solo from Lovano, offset by the joyous groove of Hemingway, held together by the composer’s firm center of gravity. There’s a minor blues feel permeating Hemingway’s “Cherry Pickin”, which begins with a trombone/bass unison before breaking into a smoking duet between the reliably woody pulse of Helias and Lovano’s tenor. It’s the details that make this so exquisite—the ping of Hemingway’s ride cymbal and the grit of Helias’ pizzicato are perfectly aligned. The second disc concludes with an extended live concert performance by the core trio best characterized by the 18-minute exploration of “The Line Up”, a wild conversation featuring Anderson’s audacious and turgid bleating and a series of free-wheeling conversations that revel in the universal language of the blues. 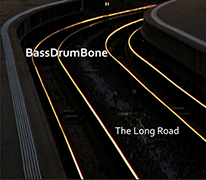 If you are new to BassDrumBone, or haven’t checked in with them for a while, The Long Road is an excellent place to start. Highly recommended. Ein sehr erfreuliches Comeback einer der wenigen „Supergroups“ des Jazz. six excerpts from the "The Long Road"
Track Listing: CD1: Oh Yeah (Anderson); Bungle Low (Helias); BluRay (Anderson); Kemp (Hemingway); Why Not? (Anderson); Quompot (Helias); Tone L (Hemingway); At Another Time (Hemingway). CD 2: Bluish (Helias); Different Cities (Hemingway); Cherry Pickin (Hemingway); The Line Up (Helias); Lands’ End (Helias). Personnel: Mark Helias: bass; Gerry Hemingway: drums; Ray Anderson: trombone; Jason Moran: piano (CD 1, tracks 2, 5 ,7); Joe Lovano: tenor saxophone (CD1, track 3, CD 2 tracks 1, 3).